Tutors and classroom instructional aides/paraprofessionals provide critical learning support to students and assist teachers in delivering quality instruction. They are valued members of the educational team; yet often, they are expected to perform their duties with very little training. The research, however, has clearly identified that explicit training is essential in order for tutors and classroom aides to serve students effectively. 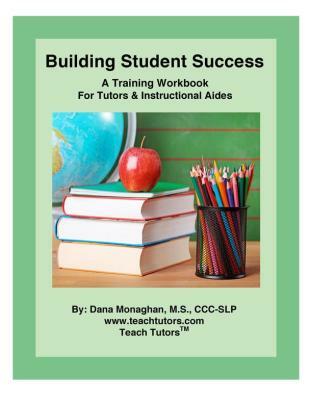 Building Student Success: A Training Workbook for Tutors and Instructional Aides is a 47-page, research-based workbook designed to teach individuals to serve as effective peer tutors and classroom aides. The topics contained in this curriculum have been carefully selected to address the key elements identified by research as being critical to quality tutor and paraprofessional instruction. These essential topics include utilizing effective strategies to deliver direct instruction, providing positive reinforcement and appropriate feedback, developing supportive relationships with students and maintaining professionalism. This workbook is practical, easy to use and delivers information in a user-friendly manner. It can be used by educators as a training tool and curriculum for preparing individuals to serve as peer tutors, cross-age tutors, and instructional aides or it can be used by individuals who wish to serve as tutors or instructional aides as a self-study course. Study questions are provided at the end of each section to review content and encourage reflection. The peer tutoring and instructional aide training workbook also contains an assessment or skills inventory tool, goal development sheet and suggested group activities to assist peer tutors and school paraprofessionals in improving their skills. This material is appropriate for secondary students and adults including middle school, high school, and college students as well as instructional aides and paraprofessionals. Also included with the purchase of the digital workbook or the purchase of 10 or more printed workbooks, is an 18-page supplemental Users Guide designed especially for teachers and program facilitators containing helpful tips, notes and suggested lesson plans that correspond to the material in the workbook. 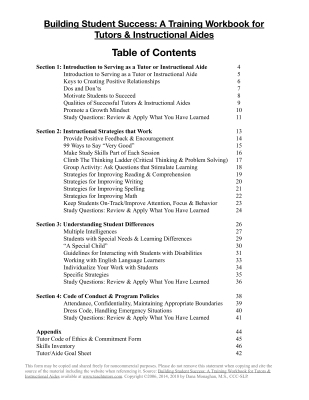 The topics included in the peer tutoring, cross-age tutoring and classroom aide training workbook can be viewed in the Table of Contents shown below. 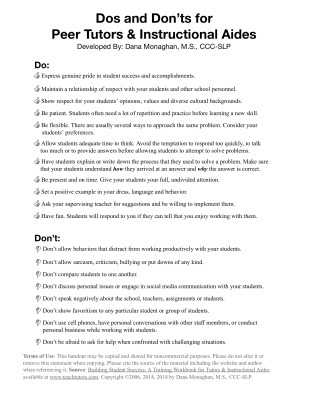 I have also included the handout “Dos and Don’ts for Peer Tutors & Instructional Aides” and the “Tutor & Aide Code of Ethics and Commitment Form”. Both are contained in the workbook and will give you an idea of its contents. You may click on any of the images below to enlarge and download a free PDF copy of these resources. Please feel free to duplicate and share them as needed. Digital Version - No shipping costs and ready to go! Save time and money with the digital PDF version. Receive the workbook by email within 24 hours of completing your purchase. 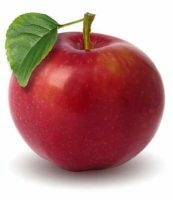 Included with digital workbook purchases is a supplemental, 18-page Teacher's Guide containing training tips, notes, strategies and suggestions for using the curriculum with your tutors and instructional aides. An answer key for the study questions as well as activities and lesson plans to use during group training sessions is included. This is bonus material included in purchases of the digital workbook or printed workbook orders consisting of 10 or more. For $75, you receive authorization to make as many copies as you need for program participants at your specific school or agency location for educational purposes. It can be duplicated and used year after year at a single site. For $189, receive an organization or district license authorizing you to copy and distribute the material to program participants at all of your locations for one, affordable price. Purchase the digital PDF file of the workbook to print and distribute copies to your program participants. Make as many copies as you need at your specific location with the single site use option or for use throughout your entire agency, organization or school district with the agency/district-wide option! Workbooks cost $19.99 each and arrive spiral-bound and ready to use. You will need to purchase a copy for each participant in your program. This material is copyright protected and may not be reproduced; however, 25% and 35% quantity discounts are offered when you order 10 or more. Please note that the supplemental, 18-page instructor's guide containing training tips, strategies, an answer key for study questions and lesson plans for group training is not included in purchases of the printed workbook unless your order consists of 10 or more copies. If you would like the Teacher's Guide, please consider purchasing the PDF version of the workbook which allows you to make unlimited copies for your program. Please click on the option below that applies to you based upon the number of workbooks you plan to order to make a secure purchase using PayPal. There is a minimum order of two workbooks. Why? The printed version of Building Student Success: A Training Workbook for Tutors and Instructional Aides is an 8.5 x 10 spiral-bound, color workbook that is shipped to you by mail. It contains forms, questions, and other activities to be completed in writing by the individuals being trained; therefore, you will need to purchase a workbook for each tutor or instructional aide in your program. You do not have the option to make additional copies as it is copyright protected and you will not receive the supplemental Teacher's Guide included in digital workbook purchases unless your order consists of 10 or more workbooks. Most teachers, administrators and tutoring program coordinators find the digital workbook to be more convenient and cost-effective; however, the printed workbook option can be particularly useful if you need a larger number of workbooks and want to have them delivered to you ready to use. Please allow approximately two weeks for printed workbook orders to arrive. If you need the peer tutoring and instructional aide curriculum more quickly, please consider the PDF version which arrives within 24 hours. Paypal is the preferred method of payment as it provides the ability to use a credit or debit card securely and quickly. Your transaction can be processed immediately and you receive your order right away. You may check out as a guest if you do not have a Paypal account and you are not charged any fees. Purchase orders are accepted for orders of the digital PDF file and for orders of 5 or more workbooks. Please email to request P.O. information. Learn about shipping costs and approximate shipping times on the FAQs page. Sales tax of 7.5% will be added to CA orders. International Website visitors: You may quickly and easily obtain the PDF version of the workbook through Paypal with no shipping fees joining other educators who are already using the material in Canada, Great Britain, Ireland, South Africa and Australia. Shipping of spiral-bound workbooks outside of the United States is not available at this time. If you have any further questions, please contact me at [email protected].